When it comes to my skin, I used to be extremely lucky. "Used to be" being the operative part of that sentence. I spent my early 20s with a clear complexion, only battling with the occasional dry spell (which The Ordinary's Hyaluronic Acid 2% sorted right out, FYI) and the odd spot. Now that I'm 27 it's a totally different story. I've struggled with hormonal acne for just under six months now, and while it's still not entirely gone, there is one product that taught me how to simplify my routine. It also taught me how taking a little time out of my day to care for my complexion is so important. Keep scrolling to read my review of Elixseri's Skin Meditation Serum. As a busy, dare I say it, stressed, person, my skin definitely reflects this. Whenever I'm stressed, my skin likes to remind me of this and have a little freak-out. We're not just talking spots, as it gets dry and blotchy too. Sounds ideal, right? 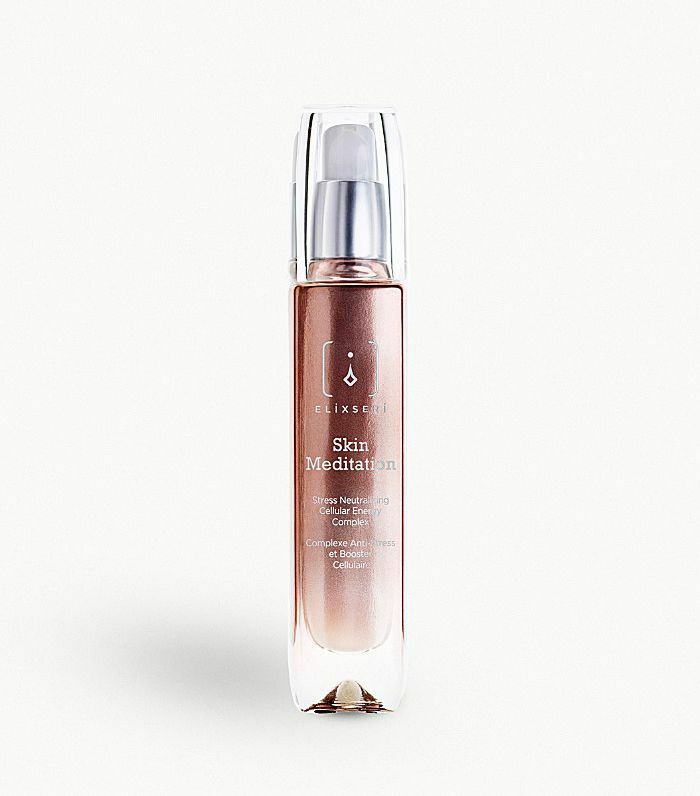 The whole point of Elixseri's Skin Meditation Serum (£100) is to combat signs of stress, pollution and hormonal changes within the skin. So naturally, I and my stressed-out skin practically jumped at the chance to try it out. Packed full of natural actives specifically chosen to counteract the signs of stress, its silky-smooth texture glides on the skin like a lightweight serum. It feels both cooling and soothing, which immediately calmed me. It's not tacky, which meant that rather than rushing the application process, I actually took my time and enjoyed it—something I rarely do. With soothing and balancing ingredients like Swiss alpine crystallised light water and prebiotic mangosteen ferment, by the next morning, my skin felt and looked less inflamed. This combined with enriching argan oil meant my skin felt restored and hydrated. Plus, it's got a hint of citric acid, which makes it smell amazing. The one thing that really stood out for me about this product was that it encouraged me to take moments out of my day to focus on my skin. It's such a luxurious product to apply, which forced me to pat it on slowly and carefully. It really does instantly get to work to soothe irritation, and I found myself looking forward to applying it both morning and night. And while my hormonal acne still rears its ugly head now and then, my complexion looks and feels more balanced and less stressed—and I've learned the importance of taking just a little time out to care for it does wonders for my skin and mind. Up next, try out this meditation app if you're feeling stressed.